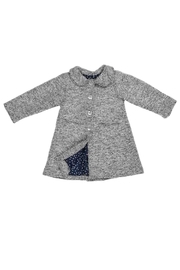 Gorgeous Malvi & Co. grey boucle coat with two front pockets and a Peter Pan collar. Fastens down the front wth pretty mother of pearl buttons. Lined with contrast navy spotted lining. Fiber Content: Coat: 80% Acrylic, 20% Lana Wool. Lining: 97% Polyester, 3% Elastane.